Yuki Mizu Kumo from Amsterdam had invited Jelena Vrzić from Belgrade, Serbia, to the Netherlands. 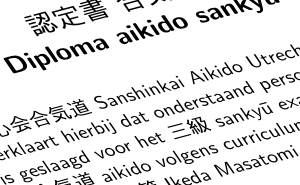 On Thursday evening the 10th of March a joined training at Sanshinkai Aikido Utrecht was held. It was a delight to welcome this sensei again and receive guests from different groups in Amsterdam and Utrecht. Thursday 3rd of February, David Tesselaar of Yuki Mizu Kumo from Amsterdam has given a guest lecture of one hour. A kyu examination was held subsequently. Hereby congratulations go to M.C. 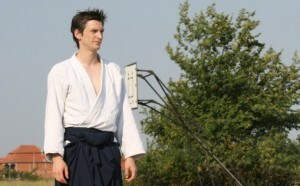 Keuken who passed the examination and with that has obtained the third kyu. Happy New Year! Today is the start of a new year of trainings. If you are interested in Aikido and have New Year’s resolutions to move more and healthier, please browse through our website. For more information or a free trial lesson, please contact us. 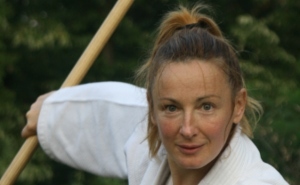 Yuki Mizu Kumo from Amsterdam had invited Jelena Vrzić from Belgrade, Serbia, as guest in the Netherlands. 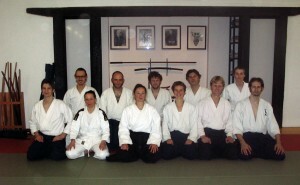 Together with Sanshinkai Aikido Utrecht a training was organised on Monday evening the 22nd of November in Utrecht. Many thanks to out to Budo Akademie Shudo Kan for a joint training in their dojo. Eric Graf and Sander van Geloven held a seminar on the 6th and 7th of November 2010 in Neuchâtel, Switzerland. During this event the hojo no kata and to no kata of Kashima Shinden Jikishinkage-ryū have been practised.